A legendary white gospel pioneer of the '50s FERN JONES is remembered. Mike Rimmer spoke to Fern's daughter Anita Garner. Fern Jones probably isn't a name that you've come across at all and yet she was responsible for producing a seminal gospel album at the birth of the rock'n'roll era. 'Singing A Happy Song' was released in 1959 where, backed by Elvis Presley's latest studio band, she cooked up a storm mixing country, rockabilly and gospel in a thoroughly contemporary style. Listening to the album nearly 50 years later, one thing that comes across very strongly is the power of Jones' voice. People have compared her to Patsy Cline and quite rightly but instead of singing sad songs of love and loss, Jones' passion was to sing truth-filled gospel songs, challenging her listeners and bringing enough of Saturday night musical values to place this gospel record at the cutting edge in 1959. 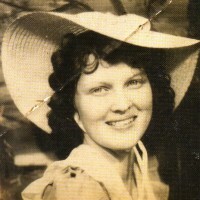 When she stepped into the studio in 1959 to record for Dot Records, she already had 25 years of singing experience under her belt and at the age of 36 was a veteran of the southern revival circuit where she and her husband Ray Jones and their family travelled around and held revival meetings. Sometimes they would take time out and pastor a church but music was always at the heart of their ministry. In 1959, religion and the newly emerging rock'n'roll weren't as far apart as a lot of white preachers were intimating in their pulpit dismissals of the new music. Pioneers like Elvis Presley, Jerry Lee Lewis and Little Richard brought huge church influences into their music and while Jones stayed on the other side of the musical fence, staying true to the message. Her early music had been non-religious and had been performed in the honkytonks before she gave it up to sing with her husband and support his calling to ministry. Listening to her album, you could say that you could take the girl out of the honkytonk but you couldn't take the honkytonk out of the girl and something of that wild side remained in her gospel music. My interest in her music began with the re-release of 'Singing A Happy Song' in 2005. The album, now renamed 'The Glory Road', had a CD release and included some bonus cuts from Fern and Ray's custom recordings made in the early '50s. Sadly, Fern didn't live to see the release, even though she'd been fighting since 1968 to buy back the masters from the record label. She passed away in 1996 but the work to have the album re-released was continued by her daughter Anita Garner. After I wrote the review of 'The Glory Road' for the Cross Rhythms website, Garner contacted me and I had the opportunity to quiz her about her mother, her childhood on the road at the revivals and some of the extraordinary events of her mother's life. Effectively Anita was born into the family "business" of travelling evangelists. She remembers, "In the Deep South, we covered medium-sized cities to rural areas, travelling the same circuit as say a Billy Graham or an Oral Roberts. But they went on to become sort of 'mega evangelists' and daddy was much more comfortable with the country. He was a country boy. He worked to become ordained in the Assemblies Of God and later so did mother. So for about half our time we were in the evangelistic field. The other half the time the church would ask my father to pioneer a church in a town where there wasn't one. That was quite a particular set of skills. So we did both." Coming from an extremely poor family, Fern Jones first started singing at the age of 12. Garner explains, "She was tall, quite matured physically and very, very poor. I've spoken to a lot a of people about how one person emerges without any money or any hope of success and sort of dazzles. I think she just had such a faith or such a drive to get out of extreme poverty. So she lied about her age. She got a Sears Roebuck guitar from a catalogue, learned a few chords, had an enormous voice and looked mature. Every one in the South just turned their heads and pretended she was old enough to be in the those joints." She married at the age of 16 and very shortly afterwards became a Christian. Garner tells the story, "Daddy went down to the altar and turned his life over to the Lord. The story that they tell is that he went home, got her - she'd never attended church - took her by the hand and prayed with her all night." Ray Jones began pastoring a small church in Arkansas while working a day job to pay the maintenance bills on the church. People would come to the little church, hear Fern sing and almost immediately the invitations began to pour in so she started her singing evangelistic ministry. I observe that this was a big calling for a young woman barely saved. Garner shares, "I think there was a lot of conflict with her attempting to grow into a woman. She was a mother at 16 and then I was born when she was 18. I think daddy in a sense was helping raise her. He was nine years older. He was the eldest of 10 and he was crazy in love with her. So she had these mature gifts, but she was still a teenager." Anita Garner's own upbringing involved a great deal of travelling and she had to try and fit into plenty of new schools along the way. Her parents also had their own radio shows whenever they settled somewhere. Anita soon joined the family act and at age three she made her debut on a radio station in Georgia. She remembers, "My family always had a radio show. So it was the family business. Just as if you'd been born to a plumber and he would teach you to use your tools, my parents would pile us in the car, we'd travel to a revival and in the back seat we would learn to sing our harmony parts." The radio exposure and their custom albums helped to bring Fern Jones' music to the masses. There is one song on her album that also worked to bring her music to the masses. "I Was There When It Happened" is credited as a co-write with Jimmie Davis who added himself to the credits in exchange for publishing the song and attempting to make it popular. Anita tells of her mother's struggle with this. "This is a dilemma mother wondered about until she passed; would it be better to have 100 percent of nothing and have no-one ever hear your song? Or to sell half of it and have a famous gospel star record it? And she'll never know the answer. But she regretted forever that she sold half the song. And later, she was talking with both Rick Nelson and Elvis about recording her music. Each of them had chosen a song. Both of them insisted on half composer rights or they wouldn't record it and she did say no." "I Was There When It Happened" became one of the favourite songs of the young Johnny Cash. If you've seen the movie Walk The Line then you'll have heard the song! Garner explains, "John told me this story himself in the 1960s. And then I've recently spoken to one of the original members of his backing group The Tennessee Two, Marshall Grant, who confirms that Johnny really planned to record only gospel. The movie depicts him showing up for an audition at Sun Records, being told to sing something, anything other than gospel and immediately being signed. Marshall says that when they went to sing for Sun Records they only knew "I Was There When It Happened". They'd been performing it at a few little places - churches, high school dances. So John said, 'Well, I want to be a gospel artist so we'll sing that one." And Sam Phillips really sent them home for a few days to write another song. But John told me that he sang "I Was There When It Happened" as a personal testimony in every performance that he could." Listening to 'The Glory Road', the one thing that immediately strikes the listener is that unlike many anodyne white gospel albums of the time, this one is very bluesy. It sounds wild. Garner agrees, "It was. It was so wild. She was following her own instincts with those recording sessions for that Dot album. It was so wild that it almost killed her for airplay. She'd been a favourite performing live on radio in six States. They couldn't play many of the cuts from this album on white stations because she sings so black. And this was during the time of segregation in the South that we came up with her singing like that. She would have fit on race stations much better but she was too white for them!" And that's where the problem lay. The album fell between two stools and despite the fact she'd turned in a great album, the lack of airplay stymied its success. Garner observes, "She turned out this amazing album with some of the most famous studio players; the ones who toured with Elvis. To this day no-one knows how she pulled all that off. And I don't think she knew she was a pioneer. I never heard her say any words to the effect that she was breaking new ground. I think she's one of those innovators that you read about and hear about who simply heard a new way to do something and didn't know she couldn't." The album was made in Nashville and featured some amazing musicians who had just been recording sessions with Elvis Presley before backing Fern. Garner shares, "I speak now and again to Hal Bradley, who's the president of Nashville Musicians Union. Hal and his brother Owen owned the studio where mother's tracks were laid down, The Quonset Hut, now owned by Sony. Owen Bradley produced Pasty Cline. Hal said to me that he went back because his sister had preserved a lot of the log books from recording sessions. He can't find mother and those musicians during the year in which they would have to have recorded it but he said for sure, it's at his studio because there was only one other RCA Victor studio and they wouldn't have let her in there. Plus those 18 musicians only worked at The Quonset Hut that year. So we've pegged it to where she did it and when she did it." To my knowledge...she wrote to great gospel song, "I Was There When It Happened." I'd really like to know the YEAR she wrote it. any HELP out there? Great article about a music pioneer. Someone should do a movie about her life! How can I get some of her recordings on CD? We just lost another great "country boy" Eddy Arnold yesterday at age 89 an whose wife died on March 11th of this year. Jerry Wallace (Nola) died May 5th at ago80 I believe. Do let me know how I might secure some of Jones' recordings. I have the original Dot album by Fern Jones and have not noticed any mention in reviews of the recent reissue of the Sunshine Boys backing her on the LP. Eddie Wallace of the Sunshine Boys is a good friend of mine and I'm sure Eddie could provide some insight into the particulars of the recording session(s). Eddie lives in the Atlanta area and I believe his phone number is listed in the phone book, perhaps as Ed F. Wallace, Sr. The Sunshine Boys, with J. D. Sumner as the bass singer at that time, backed Red Foley on "Peace in the Valley" in 1950 or 1951. J. D. then sang on the Blackwood Brothers recording of "I Was There When It Happened" which I am told was featured in the "I Walk the Line" movie of a few years ago. The other three Sunshine Boys--Eddie Wallace, Ace Richman, and Fred Daniel--appeared on both the Red Foley recording and the Fern Jones LP with Burl Strevel being the bass singer on the Jones LP. As a side note, the Sunshine Boys appeared in some twenty mostly western movies in the forties and early fifties with J. D. and Fred Daniel appearing only in the last one but Eddie and Ace appearing in all the others along with brothers Tennessee and Smitty Smith. The Smith Brothers were a popular duo themselves in the Atlanta area on TV, radio, and recordings on the Capitol label and an LP on the Sing gospel label. I hope this info will be of interest and that it could trigger finding additional particulars from Eddie Wallace. Raymond & Co: Come in Number 6... your time is up! Irish alternative rock band FIVE DOLLAR SOUL are quizzed by Tony Cummings.